I was encouraged and inspired by Jill at Jill’s Art Journal to keep a daily art journal. I’ve never done this before, other than what I post here, but sometimes my posts here really aren’t sequential, so I thought it’d be cool to do, a fun way to track my progress (such as it is). Thought I’d share the first page with you. It is kind of messy, because I did a quick sketch in pencil of a mama bluebird feeding her chick before making a Mother’s Day card in watercolor pencil for my mom. So I almost didn’t share it, but then I thought: Life is messy. Right? So a journal can be messy too. I hope you get a kick out of it! 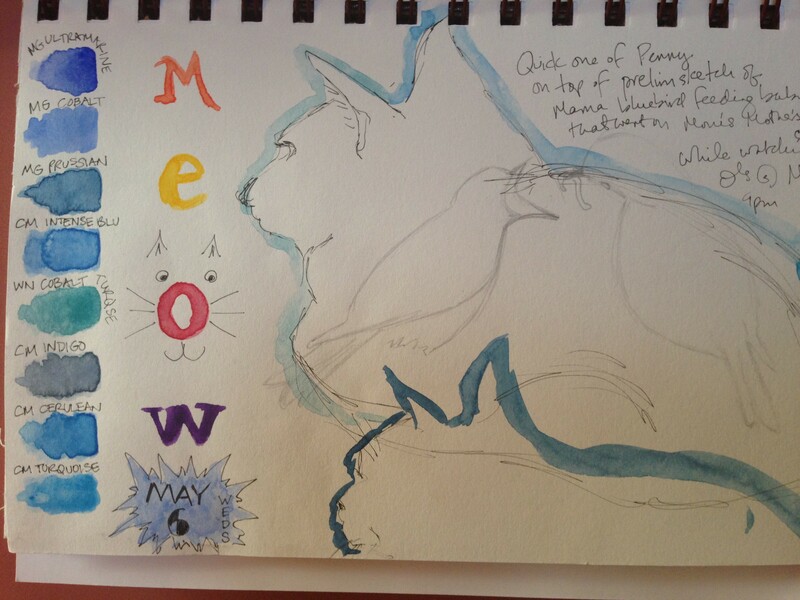 My cat, Penny will probably be starring in a few journal pages, as she’s usually on my lap when I’m sketching. Unfortunately, she moves a lot, which is why the top sketch makes her look like one of the Whos down in Who-ville. It’s all good, I’m gonna roll with that journal and just experiment and have fun with it. I’m trying to swatch out my watercolor paints, because my memory really is that bad. Other than sap green, ultramarine blue, alizarin crimson and lemon yellow, I don’t really know what the other colors will look like when I get them on the page. So….my journal is gonna be helping me out with that. Actually, this exercise was very helpful, just making the page and printing the color names will help me visually to keep this straight. Happy Mother’s Day Weekend to all the moms of all kinds of critters, be they wing-ed, scaled, two-legged, or four-legged! Sending love and peace and lots of creative merriment to you and yours today. Good job 3 days! 😝. Good stuff! Happy Saturday! May the day stretch long and lovely! Yes, may it ever! 🙂 Have a wonderful weekend, Jodi! Savor the moments. Sweet cat drawings and good swatches. Congrats on doing the daily drawing in your journal…it is also a fun way to capture memories or create them! Thanks, C, let’s hope I can stay with it! I’m really enjoying it so far. Love the O-cat. Good start! Speaking of O’s…good day right? Thank you, Ann, what a sweet comment. I’m so glad you liked it. I’m really enjoying that journal, more than I ever thought I would. I’m so glad your sister was pleased by what I said. She could easily walk in your footsteps, I think! Is she much younger than you? Thank you so much, Laura!!! 💕 I´ll tell her! I like the way you have the cat twice, this is lovely! Thanks! She only sits still when I’m not drawing her lol. Glad you like it! Art Journals Rule! Keep it going! !